JUSTIN’S PICK :: HENRY & GLENN FOREVER & EVER #1: There’s a lot of stuff I’d pick this week: Uncanny Avengers #11, pitting Wolverine against a resurrected and repowered Daken, or Aw Yeah! Comics’ great new Itty Bitty interpretation of Hellboy and company. 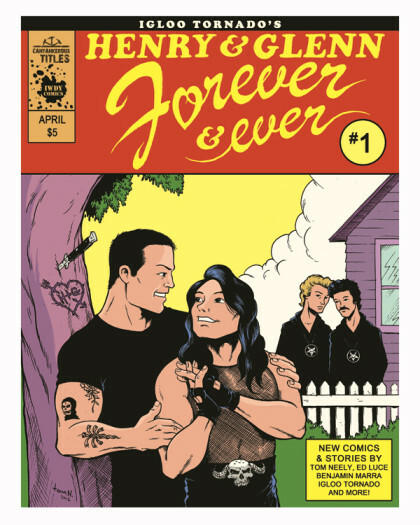 But despite all that, my pick is Henry & Glenn Forever & Ever #1. The original H+G consisted of one-panel gags by the slick chaps at art collective Igloo Tornado, along with journal snippets and a Satanic Hall and Oates to round out the hilarity. Now the gang’s back together (with some new pals in tow) offering up all-new sequential strips starring the star-crossed couple. See! Glenn’s reaction to the first book! Witness! Henry unleash a dastardly threat from beneath the front yard! But mostly, laugh. And if you haven’t checked out the original book – Henry & Glenn Forever, remember – no coffee table is complete without it!